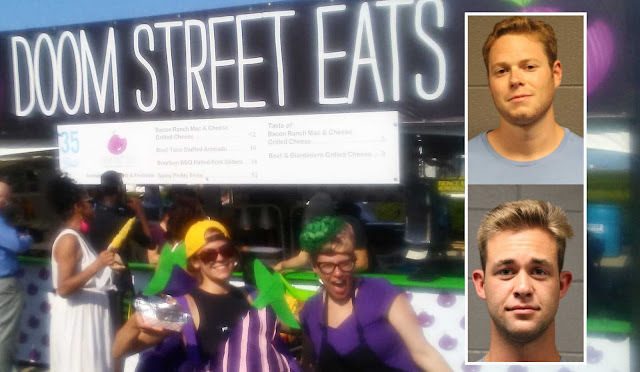 Two men are charged with conning their way into a food storage area at the Taste of Chicago to steal hundreds of dollars worth of pickle fries and bacon mac ’n’ cheese. The folks at Doom Street Eats were dishing the munchies from their booth at the annual festival on July 14th. That evening, 21-year-old Timothy Rooney Jr of Fort Wayne and 22-year-old Erik Woehnker of the Loop “posed as representatives from another food booth” to access a food storage area, according to a police report. Once inside the food locker, Rooney and Woehnker each took about $100 worth of pickle fries and bacon mac before slipping away, prosecutors said. While the duo was inside the storage area, they “touched and knocked over food” that had to be thrown away due to contamination, police said. After discovering what had allegedly happened, a witness went looking for the pair and reportedly found them standing in the intersection of Columbus and Jackson near the festival. Both men are charged with retail theft. Doom Street Eats’ menu selection at the Taste included a bacon ranch mac & cheese grilled cheese and spicy pickle fries. They’re both quite tasty, it seems.